NOTE: This product was purchased at Walgreens. Purpose: "... creates softness and strength while protecting your hair from harmful styling heat and UV damage ..."
Ingredients: Water (Aqua), Cetearyl Alcohol, Cetyl Alcohol, Behentrimonium Chloride, Glycerin, Argania Spinosa (Argan) Kernel Oil, Hydrolyzed Keratin, Theobroma Cacao (Cocoa) Seed Butter, Persea Gratissima (Avocado) Oil, Aloe Barbadensis Leaf Juice, Glycol Stearate, Glycol Distearate, Ceteareth-20, Isopropyl Alcohol, Dimethicone, Cyclotetrasiloxane, Citric Acid, Cyclopentasiloxane, Panthenol, Cocos Nucifera (Coconut) Oil, Tetrasodium EDTA, DMDM Hydantoin, Methylchloroisothiazolinone, Methylisothiazolinone, Yellow 5 (Cl 19140), Red 40 (Cl 16035), Fragrance (Parfum). Applied to the ends (the last few inches) of freshly washed hair. This conditioner was okay. It did not leave me blown away or wanting to purchase more. I get the same (or probably a bit more) softness and strength from my ORS Replenishing Conditioner and ApHogee 2-Minute Keratin Reconstructor. 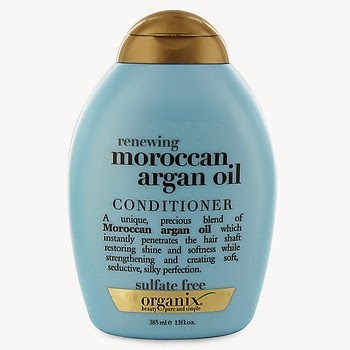 RATING: Overall, I give the Organix Renewing Moroccan Argan Oil Conditioner 2.5 out of 5 stars.